The Beyla is the smaller version long ship with a capacity of just 98, she was built in 2015. Sailing on the Beyla is serene with no noticeable noise or vibration. Décor is light with Scandinavian influences, Beyla is comfortable and attraction with abundant natural light. Beyla does not have an elevator. Entertainment is varied from after dinner piano to a Classical Trio. Performances were well attended. Lunch has a salad bar and pasta station and menu with table service or there is a buffet in the lounge area. Breakfast is buffet with a cooking station. Dinner is served. Food was good to excellent and service was attentive. The Silver Spirits package is the best kept secret in the cruise industry. Premium wines and top-shelf spirits are freely poured by the very knowledgeable bar staff. Beer, wine and soft drinks are included with meals at no charge. Fellow passengers are mature and seem of varying levels of fitness. With such a small ship there are not as many shore excursion choices, however accommodations are made for those who do not want to walk as much. (Exception to this is Prague which is a walking tour since coaches are not possible in the old city). Overall there is a good balance between activities and free time. I was pleased with both the quality of the equipment and the guides. Our Program Director Rik met us at the Viking desk prominently set up in the Hilton Lobby. Smiling and friendly he gave us an overview of the days before we join the ship. Rik will be with the group until we leave for the airport in Berlin. Several other Viking representatives were also available for assistance in Prague. The first evening one of the Viking reps lead a walk to a nearby square, pointing out restaurants, shopping and transportation options. The pre-cruise stay was at the Prague Hilton. Convenient to restaurants, shopping and public transportation. The included breakfast is extensive and very good. Of note there is not a taxi queue and guests are directed to black cars at about twice the taxi rates. We joined the ship in Decin in the heart of the town with a small-town festival in full swing. As dusk fell there was a big bonfire to burn a symbolic witch to celebrate the end of winter. The Elbe is a natural river with no dams and the first part from Bad Schandau to Dresden reminded me of the Buffalo National River with the dramatic rock formations. Of note there was no rafting as Viking is the only North American river cruise company with sailings on the Elbe. We had a long talk with the bar manager and the musician after the rest of the passengers retired for the night and their job satisfaction was effusive and heart-felt. They truly felt that Viking puts their primary emphasis on the crew trusting that it will naturally extend to the passengers. I feel that this corporate philosophy is working well for Viking. Of note, when I noticed that the entertainer was helping the bar manager clean up after an event, he simply said “he is my friend”. And then when I saw the bar manager helping in the main dining room, “they are our guests”. With two overnights in Dresden it is nice to stroll into town and just enjoy this pleasant and calm city. I’ve been to West Germany and found it beautiful and so is East Germany but hearing from guides even younger what it was like to live under communist rule was heartbreaking. It may be the generations born after the Russian departure that completes the healing. I know that if I ever have the opportunity to return that I will. 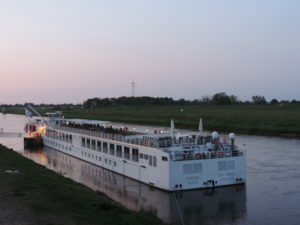 My personal favorite cruise itinerary to date was my first river cruise on the Seine many years ago from Paris to Normandy with Viking, this itinerary has particular significance to me since my Dad was a paratrooper behind the enemy lines in France on D-Day. I’ve had many memorable trips since then, but this Elbe river cruise is special. I will recommend it as it is an unknown gem. This short 5-night cruise is so well orchestrated that it leaves you yearning for more. Our late-April to early-May departure had perfect touring weather and we had a bonus of a second spring since the lilacs were in full-bloom. I find Viking air easy to work with but always suggest their custom fee to secure the flights of interest. Viking is currently using Star Alliance airlines (United). Wi-Fi is available at the hotels and on the ship. Ship Wi-Fi is wimpy. Some of the best Wi-Fi was surprisingly on the tour bus. I was able to down load all of my podcasts in less time than at home. As many of my reviews suggest, pack some post-it notes to cover up some of the night lights if you are light sensitive. Between meal snacks are limited so if you have favorites you may want to pack some. There is a coffee and tea station that has cookies and there was fruit available. Gratuities can be added to your on-board account. Much easier than figuring out the Euros. Berlin at night is not a tour I would repeat, it covered many of the same things in the included morning tour. For those who cannot walk long distances over cobblestones, it would be best to arrange a different tour than the Viking included tour I Prague. In total is 3.5-4 miles of walking.